Not all leaks or water damage comes from obvious sources, such as pipes or toilets. Sometimes, the origin of the damage can be less readily apparent and far more subtle. Unfortunately, that means it can often go unnoticed for quite some time. Although it’s not as clear a culprit as a washing machine or dishwasher, refrigerators can potentially cause serious harm to your floors. Icemakers are definitely convenient, but icemakers can cause issues. The two most common problems are a buildup of condensation or a leaky hose. Condensation is generally less noticeable and fairly easy to overlook. A leak can generate dampness in unexpected places or leave a noticeable wet spot on your floor. However, both condensation and a leak can cause damage. Condensation is less likely to cause serious water damage to your flooring, although it can if left unnoticed for a significant period of time. The more likely problem with condensation is mold. Damp areas create an ideal environment for mold to grow. 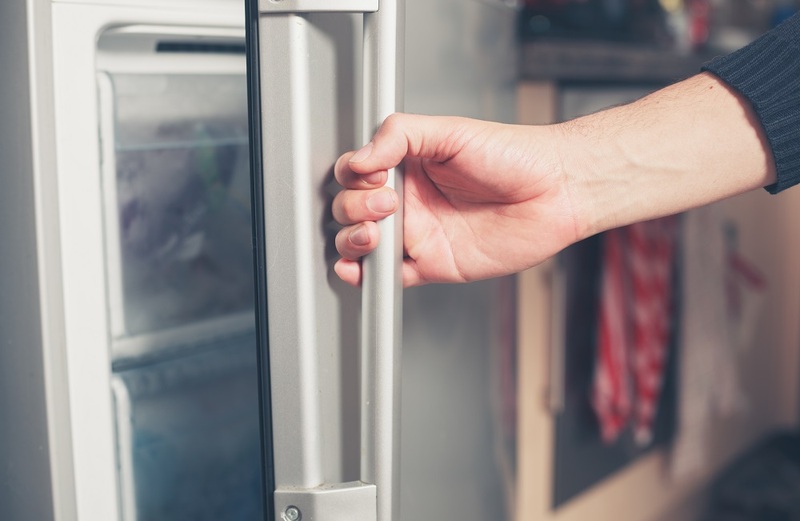 If you’re noticing mold symptoms, you should check under or behind your refrigerator to determine if it’s responsible. Mold that grows inside your refrigerator should be easy to spot, but it is possible. A leaking hose is usually not difficult to identify and should be fairly simple to repair. It could require nothing more than removing it and reattaching it more securely, although it may need to be replaced. Unfortunately, water damage to your flooring can be serious. You might need your flooring near the refrigerator to be replaced entirely. Wood flooring can begin to separate or warp, and tile can also suffer from water damage. Most commonly, tile will come loose, because the water can cause the adhesive to detach. The water hookup behind your refrigerator shouldn’t generally be a problem, but a small drip or leak could lead to a major headache. As with condensation, it may go unnoticed for a long time. It can gradually damage your flooring or even your wall. If you need assistance with water mitigation in Kennesaw, don’t hesitate to contact the professionals. A quick response is always best. Call the experts at Integrity Restoration & Remodeling Contractors as soon as you notice water damage.